Citation Information: J Clin Invest. 2019. https://doi.org/10.1172/JCI122954. 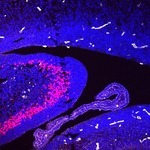 Molecular signaling mechanisms underlying Alzheimer’s disease (AD) remain unclear. Maintenance of memory and synaptic plasticity depend on de novo protein synthesis, dysregulation of which is implicated in AD. Recent studies showed AD-associated hyperphosphorylation of mRNA translation factor eukaryotic elongation factor 2 (eEF2), which results in inhibition of protein synthesis. We tested to determine whether suppression of eEF2 phosphorylation could improve protein synthesis capacity and AD-associated cognitive and synaptic impairments. Genetic reduction of the eEF2 kinase (eEF2K) in 2 AD mouse models suppressed AD-associated eEF2 hyperphosphorylation and improved memory deficits and hippocampal long-term potentiation (LTP) impairments without altering brain amyloid β (Aβ) pathology. Furthermore, eEF2K reduction alleviated AD-associated defects in dendritic spine morphology, postsynaptic density formation, de novo protein synthesis, and dendritic polyribosome assembly. Our results link eEF2K/eEF2 signaling dysregulation to AD pathophysiology and therefore offer a feasible therapeutic target. Citation Information: J Clin Invest. 2018. https://doi.org/10.1172/JCI123743. Citation Information: J Clin Invest. 2018. https://doi.org/10.1172/JCI122481.